The launch and deployment of the 42nd and 43rd BeiDou satellites complete the basic BDS-3 constellation. China has successfully sent twin BeiDou satellites into space by a Long March-3B launch vehicle (with an Expedition-1 upper stage) from the Xichang Satellite Launch Center, at 02:07 am, on Nov. 19. The twins, both medium Earth orbit (MEO) satellites, are the 42nd and 43rd of the BeiDou Navigation Satellite System (BDS), and the 18th and 19th of the BeiDou-3 family. The satellites successfully entered their designated orbit after more than three hours of the launch, and will join the constellation with the 17 previously launched BDS-3 satellites, after completing in-orbit test. The successful launch marks that the basic BDS-3 constellation has successfully been deployed. Networking of the constellation and assessment on its performances will be carried out in the near future. Plans are for the BeiDou-3 constellation to be put into operation before the end of this year, to provide basic navigation services to countries and regions participating the Belt and Road initiative, which will be a key milestone for BDS in expanding service areas from regional to global. On Nov. 5, 2017, the first pair of satellites for the BDS-3 constellation was launched from Xichang Satellite Launch Center. By the end of March 2018, a pilot constellation consisting of 8 BeiDou satellites was built. At present, the project is progressing smoothly, and the basic constellation consisting of 19 BDS satellites will soon be operational. In the future, BDS with global coverage will be completed by the end of 2020. Since November 2017, the past year has witnessed a highly intensive launch of the China’s BDS constellation. With the joint efforts of the whole team participating in this project, 11 launches have been completed within one year, while 19 BDS-3 satellites and 1 BDS-2 satellite have been successfully sent into space. In particular, since July 2018, seven launches have been conducted to deliver 12 BDS satellites into orbit, with the shortest interval between launches being only 17 days. Both highly intensive and high success rate of launches set a new record in the history of the BDS constellation development. 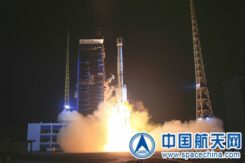 The satellites and the launch vehicle (with an Expedition-upper stage) for this mission were developed by the China Academy of Space Technology and the China Academy of Launch Vehicle Technology respectively, both are affiliated to the China Aerospace Science and Technology Co., Ltd. The launch was the 291st mission of the Long March rocket series. Currently, the BeiDou system comprises two families of operational navigation satellites; BeiDou-2, also known as Compass, presently consists of 15 operational satellites in Geostationary Orbit (GEO), Geosynchronous Orbit (GSO), Inclined Geosynchronous Orbit (IGSO) and Medium Earth Orbit (MEO). The new BeiDou-3 series, on the other hand, only has operational MEO satellites at the moment, although China is testing the first BeiDou-3 GEO satellite (BeiDou-3G1) and plans to launch at least four GEO and GSO satellites in 2019.